One of my friends living in Delhi is fond of sambar and asked me to post sambar recipe. 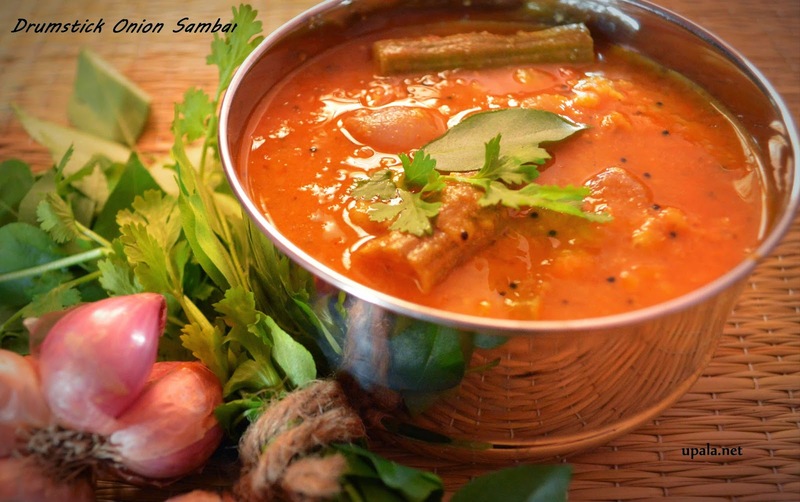 There are lots of variations in sambar but now I will start with the one which is the most popular and tasty -Drumstick onion sambar. I learnt this recipe from my Mother In Law who is an expert cook. In this method you get nice red colour tasty Sambar. This sambar is to be mixed with rice and it is a great side dish for Idly, dosa and upma. Try making this Sambar in clay pot and enjoy the traditional taste. 1) Pressure cook the toor dal, mash it and keep aside. 2) Mix hot water to tamarind and make a paste. 3) Grate the Tomatoes and slit the green chilli into two pieces. 4) Heat a kadai and add oil. Add mustard seeds to crackle then add asafoetida and fenugreek seeds. Saute for a min in low flame. 5) Add Onions and sauté for 5 mins in low flame till it gets cooked. 6) Now add grated tomato and sauté till they cook well and oil comes out. You need to sauté them in low flame. 7) Add drumstick and green chilli, sauté for 10 mins and add sambar powder and mix well. 8) Add 2 cups of water and close the kadai to cook the veggies. 9) Once they get cooked, add the mashed toor dal and mix well, let it boil for 5 more mins. 10) Add Jaggery, salt and tamarind paste, and mix well. Let them boil for 10 more mins. 11) Finally add curry leaves and coriander leaves and turn off. 1) While sautéing fenugreek, make sure it doesn't get burnt. This will spoil the taste of sambar. 2) After peeling the small onions, wash it before using to avoid any dirt. 3) If you don't get the small onions, you can use the big ones. Cut them diagonally and use them. 4) You can avoid green chilli if you want the sambar to be less spicy. 5) Sautéing the grated tomatoes gives a better taste than the cut ones. You can add the skin of tomatoes too, no need to throw them. 6) Tamarind sour taste varies according to the variety, if you are a first time cook, it's better to add less paste first and check the taste. Thanks for your great recepies, very authentic. I live in Germany and can you please tell me where I can buy unglazed clay pots for cooking? Thanks for your comments. I am afraid I don't have the information about unglazed pots availability in Germany. But there are many good websites that sell unglazed pots, you can try buying from on-line.